Intelligent Drive groups together all active and passive safety components into a well thought-out system – for the safety of the vehicle occupants and other road users. The integral safety concept brings the vision of accident-free driving another step closer. 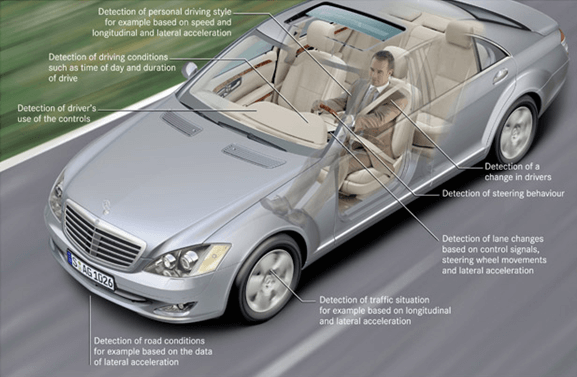 Click below to learn more about how Mercedes-Benz vehicles keep you and your loved ones safe. Adaptive Highbeam Assist – enhanced safety in the darkThe system makes driving in the dark safer and helps to reduce the strain on the driver. When the high beam is switched on, Adaptive Highbeam Assist always makes the best possible headlamp range available while avoiding dazzling oncoming traffic. The driver barely needs to make use of the high beam switch and is able to concentrate better on driving. 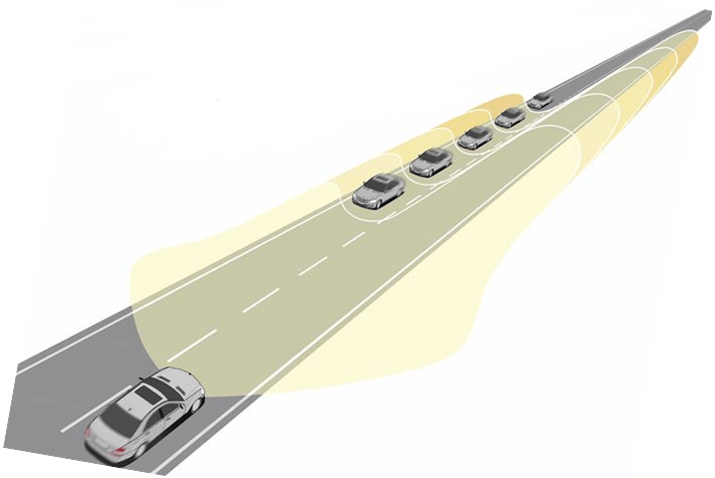 Adaptive Highbeam Assist uses continuous input from a camera to automatically vary the range of the high-beam headlamps based on the distance to oncoming vehicles and any vehicles traveling ahead of you. Blind Spot Assist warns of vehicles in the blind spot area. The radar sensors of Blind Spot Assist monitor the obscured areas to the sides and behind the vehicle. As soon as another road user is detected in the blind spot, a red triangle lights up in the relevant exterior mirror. If the driver fails to notice this warning and engages the turn indicator, the red warning triangle starts to flash and an additional audible warning is sounded. Blind Spot Assist is active at speeds from 20 – 155 mph. At speeds below 20 mph, a yellow triangle shows that the system is inactive. Blind Spot Assist can be switched on and off via the instrument cluster.Active Blind Spot Assist will go a step further if the driver does not respond to warnings, the system can intervene actively and help prevent a collision by precisely applying the brakes. An active steering movement, braking input, or acceleration deactivates the intervention of the Active Blind Spot Assist System. *Blind Spot Assist is only attended as an aid to the driver. It may not detect every vehicle and it is no substitute for due attentiveness on the part of the driver. ATTENTION ASSIST® continuously analyzes driving behavior and steering movements. If the system detects certain steering patterns that frequently accompany drowsiness, it warns the driver visually in the instrument cluster at the same time as emitting audible signals. ATTENTION ASSIST® can be activated and deactivated in the main menu of the instrument cluster under Assistance Systems. When switched on, it is active at speeds between 50 and 112 mph. BAS® PLUS is capable of more than just helping the driver to avoid collisions with vehicles ahead or lessen their consequences in a purely longitudinal direction: the new Cross-Traffic Assist function can also come to the driver’s aid when there is a risk of a collision with cross traffic at junctions.The system can provide the required braking pressure up to full braking, should the driver apply the brakes too lightly. BAS® PLUS can develop additional brake pressure to suit the situation in order, ideally, to prevent a collision. If a collision can no longer be prevented, the impact speed is reduced as far as possible by emergency braking. A system comprising long, medium, and short-range radar monitors the area in front of the vehicle together with the stereo camera. When the system detects the danger of a collision with cross-traffic, a visual warning is issued in the cluster instrument. An alarm signal sounds at the same time in order to draw the driver’s attention to this danger and requests that the brakes be applied. There are various generations of COLLISION PREVENTION ASSIST, but please note we do not call this out in our customer facing nomenclature. Please click on the corresponding generation for further system details.In general COLLISION PREVENTION ASSIST goes unnoticed as long as there is no threat of danger from the immediate driving situation. The system continually monitors the driving situation and if the system identifies the threat of a rear-end collision, visual and acoustic warnings alert the driver. 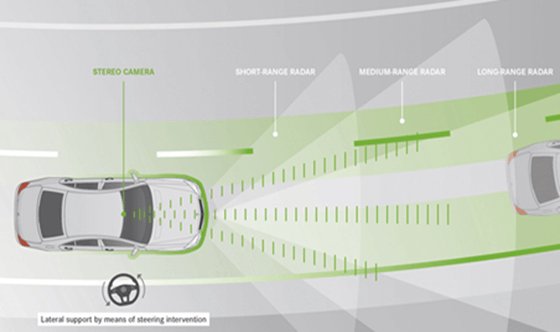 COLLISION PREVENTION ASSIST is integrated in a mid-range radar system which also serves as the control unit. The information for the displays and for braking intervention is supplied via the communications interfaces to the ESP® and to the instrument cluster. The system continually monitors the driving situation at speeds of 5 to 155 mph. If the system identifies the threat of a rear-end collision, visual and acoustic warnings alert the driver. As soon as the brake is depressed, the Adaptive Brake Assist system integrated into COLLISION PREVENTION ASSIST PLUS can boost the brake pressure if the driver does not apply sufficient brake force to prevent the accident. The system ensures that the available braking distance is used to maximum effect. In addition the system can also provide Autonomous Braking. 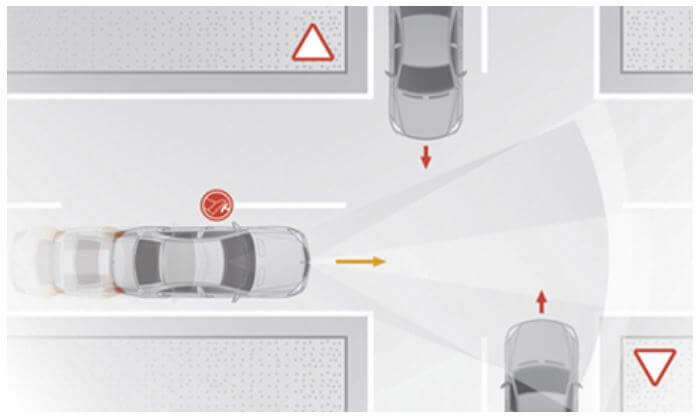 DISTRONIC PLUS®, the adaptive cruise control system, helps the driver to keep the vehicle at the required distance to a vehicle ahead within the speed range of 0 to 124 mph (200 km/h).The new steering assistance system can now help drivers stay centered in their lane by generating the appropriate steering torque when traveling on a straight road and even in gentle bends. Steering Assist is the optimum addition to DISTRIONIC PLUS® proximity control, a system which helps with maintaining the desired distance from another vehicle in front. People and animals can often be hazards on the roads at night. Night View Assist® Plus can recognize them at a range of up to 160m ahead of the vehicle. 4MATIC® permanent all-wheel drive provides for added dynamism, comfort and safety on normal roads, too. BAS® PLUS with Cross-Traffic Assist can help you not only to avoid rear-end collision, buy also collision with crossing traffic at junctions. Active Lane Keep Assist is able to give you a wake-up call and protect you from the serious consequences of a collision. In the interests of reduced fuel consumption and emissions, the ECO-START®/stop function shuts down the engine even when the vehicle is only briefly stationary and duly starts the engine up again when the journey is continued.